Adidas is going to launch three new editions of its popular UltraBoost shoe this month, made using plastic debris found in the ocean. 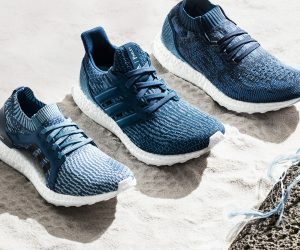 In another creative initiative to reduce pollution, the German sportswear brand has joined hands with environmental initiative Parley for the Ocean for the second time with the Ultraboost, Ultraboost X, and Ultraboost Uncaged. Available in-store and online starting May 10, these shoes will reuse 11 plastic bottles per pair and feature laces, heel lining and sock liner covers made from other recycled materials. To help achieve Adidas’ goal of creating one million pairs of UltraBoost sneakers using ocean plastic this year. 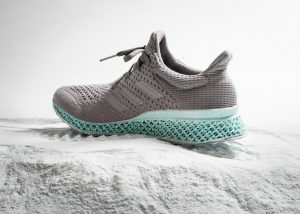 Parley for the Oceans are helping to turn waste into thread which is used in building the running shoes. “At Adidas, our core belief is that through sport, we have the power to change lives,” said Kasper Rorsted, Adidas CEO. Plastics are estimated to make up almost 80 per cent of the total marine debris in the world’s oceans. The Adidas x Parley collection is making waves in sustainability. But for the sportswear giant, turning pollution into high-performance products is more than just targeting sales. 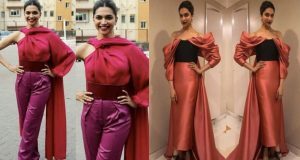 The brand spiked 18% sales in 2016, and it hopes to reach through to the consumers who are environmentally unaware about the repercussions of human activities. The initiative is part of a wider scheme to raise awareness of the problem. Last year, Adidas traded plastic bags in its retail stores for paper ones. As a result, it helped eliminate almost 70 million plastic shopping bags which is a huge step towards sustainability.